"Yo, we are so wrecked right now. We've been on the go so far for forty-six, forty-five hours, with a three-hour shivery nap in there," says Skiy DeTray into the camera, looking battle-weary and haggard high on the notorious East Face of the Mooses Tooth (10,335'), Ruth Gorge, Alaska. His headlamp illuminates near-vertical snow in front of him, and he explains that he and his partner are "basically hallucinating," but that they only have one more pitch—of relatively mellow snow—to the top of what would become their new climb, Illusions of a Raven. The team, like others before them, did not tag the proper summit of Mooses Tooth, choosing instead to stop at the summit plateau. The team established the route from May 2 to May 7. They climbed nearly non-stop over the final three days, in an 80-hour push, taking only a couple of short naps (mostly in bat hammocks). The route was rated WI4 R 5.9 A4, 5,000 feet. It's located 500 feet to the right of David Lama and Dani Arnold's 2013 climb Bird of Prey (5.10 M7+ A2 90 degrees, 5,000'), on the same wall as Jim Bridwell and Mugs Stump's iconic 1981 climb The Dance of the Woo Li Masters (5.9 WI4+ A4, 5,000'). 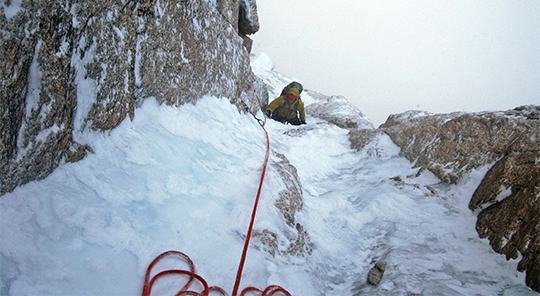 Bridwell and Stump were the first to ascend the sheer, snow- and ice-draped face. The Canadian Berg hails from Canmore, Alberta, while DeTray, an American, lives out of his van in Bishop, California. 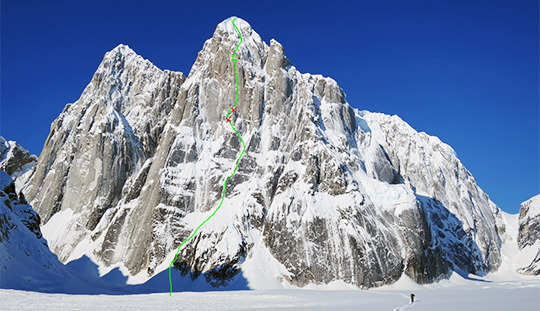 The pair had a solid winter season, making the second in-winter ascent of the Greenwood-Locke on Canada's Mount Temple, before setting out for Alaska. 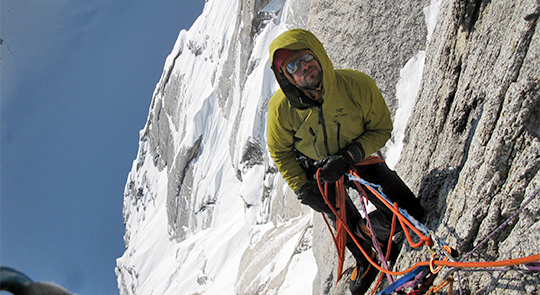 Their inspiration was Ben Gilmore and Kevin Mahoney's 2004 first ascent of Arctic Rage (WI6+ R A2, 5,000'), in which they pushed to the summit snowfield through a 24-hour snowstorm. 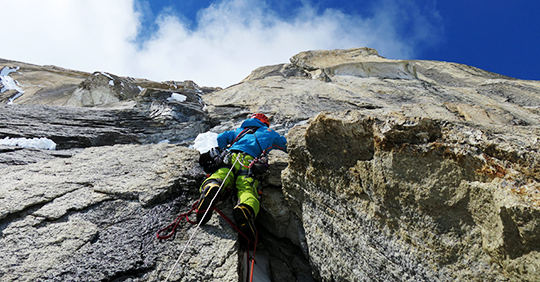 DeTray realized that "we would be able to climb [the wall] in full winter conditions," if need be, instilling the confidence to attempt a new line, with its potential complications and slow-going. 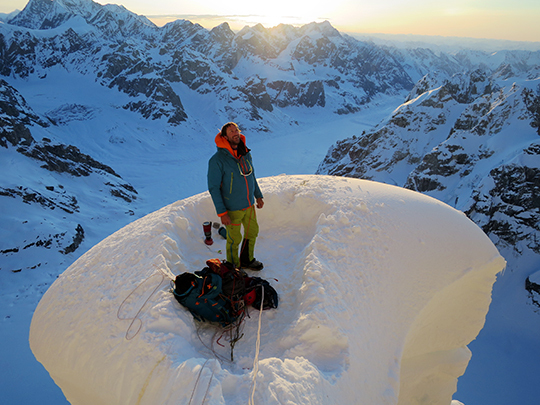 Berg and DeTray began climbing on May 2, armed with a double set of nuts and cams, six bird beaks, three knifeblades, four Lost Arrow pitons and a bolt kit (which they didn't end up using). Experienced wall climbers, the men had roughly sixty El Capitan climbs between them, and so felt at home on steep aid terrain as difficult as A4. They made their way up the lower wall, making two quick bivies, then endured a continuous 33-hour El Cap-style push on the headwall above, a characteristic feature that rears above the steeper, snowier slabs and offers many of the East Face cruxes. The men climbed through steep and loose terrain, on marginal, gritty rock mixed with ice and snow and neve. They eventually reached a snow mushroom below the final swath of headwall. "I figured it would be six hours round-trip to the summit and back down [to the mushroom]," says DeTray, but it ended up being fourteen. 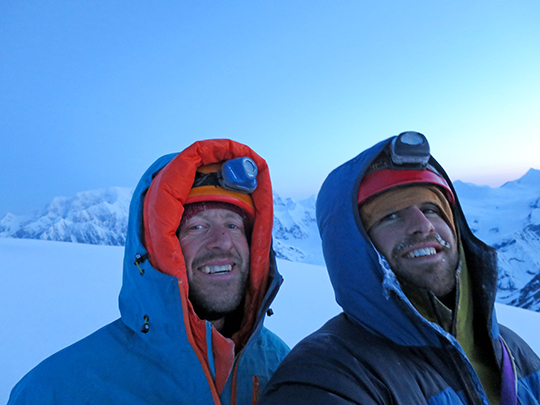 The pair climbed thin mixed terrain through snow to a WI3 ice feature to the summit cornices. Here, jokes DeTray, Berg topped out via a "V2" mantel...at 4 a.m., after 50 hours on the go. A few pitches earlier, DeTray had dropped his rappel device. "After fifty hours of no sleep, we're suddenly figuring out how to make a biner-brake rappel, thinking back to our Boy Scout days," says DeTray. "I had five biners, and at every station I broke them down and then built them back up again." Back at the mushroom, the pair took a three-hour nap, and then resumed rappelling. All told, it took them twenty-seven hours to rap the face from the mushroom. On the final two rappels, snow moved in, dumping eighteen inches over the next twenty-four hours. As for the route's name? "About hour 40 or 50 without sleep, we're both hallucinating," says DeTray. "And by the time we got back to camp, we started talking about ravens. It turns out we'd both been hallucinating ravens the whole time we were up there!" This is great reporting on an amazing feat. Skiy and Alik truly showed what years of experience, combined with creativity and motivation, can accomplish. Congratulations!